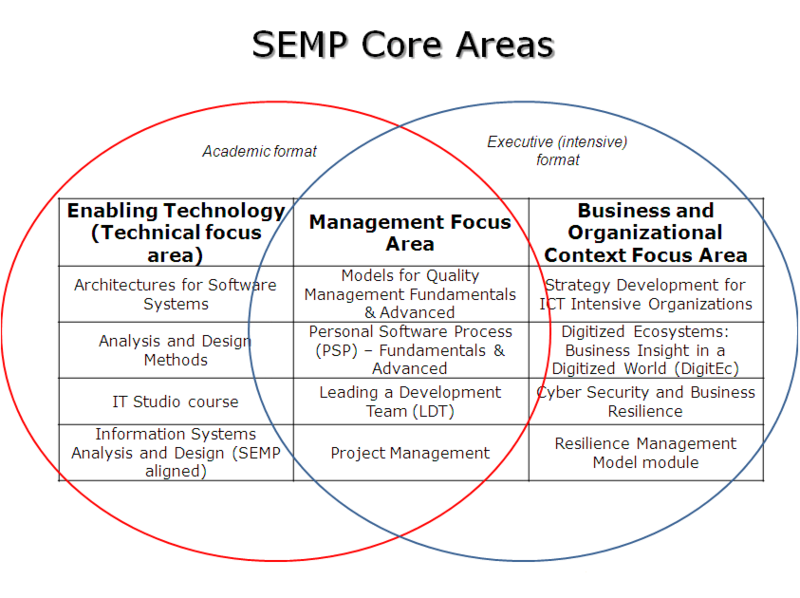 The SEMP content is designed to prepare students to manage within the increasingly technologically enabled world of global business interdependency. Managers must be well schooled to work in organizations that take on new technologies as they become available; where software and systems are fully integrated and projects are aggressive in cost, schedule and complexity. New technologies allow fresh systems to be envisioned, prototyped and developed. Managers must be able to determine what competencies to build and maintain in-house and what is best outsourced. When outsourcing decisions are made, source selection decisions should be empirically based and disciplined. Contract oversight and project management are too important to be muddled through. Risks must be identified and managed. Business concerns must fold together with regulatory issues, and matters of privacy and security. It is a complex and changing world for the government, non-profit and commercial sectors. 1) The Technical Focus Area covers engineering aspects of software intensive-systems, including topics such as software and systems architecture, engineering notations and design tools, component technologies, quality attributes, requirements elicitation and analysis, development methods. Material taught in this area shall equip students with the ability to answer questions like “What do I need to know about technology and software development techniques that will help me manage my project and make good decisions?” or “How do I know that my technical people are on the right track?”. To develop that focus area a partnership with the Institute of Software research (School of Computer Science, CMU) is established, and fundamental courses like “Software Architectures” and “Design methods” are transferred already to SEMP Bulgarian professors, under one semester “faculty visitor” program. The piloting of these courses in three Bulgarian universities is in progress for the academic 2011/12 /13/14 years. A set of advanced supplementary, or more advanced courses, are already taught by industry experts at Sofia University (Faculty of Mathematics and Informatics), and Technical University of Sofia by VMWare Bulgaria and related to their VMware IT Academy. Another advanced technology subject, related to “Secure Coding” is under development in collaboration with another division of Carnegie Mellon – the CERT center (where the Secure Coding standards are published, but also other advanced topics such as Cyber Security, Insider Threat Analysis are available). In general – the Technological focus area is covering the advanced technology trends (not the programming techniques) and preparing the managers and the team leaders to design and develop the systems of tomorrow. Under the Management Focus Area an academic version of the SEI (Software Engineering Institute) professional courses on CMMI and process improvement are delivered, thus making students equally (or even better) qualified and acquainted with the latest management models used by the world industry. A pilot course on “Quality Management Models” is thought already for the 4th year at FMI (Faculty of Mathematics and Informatics, Sofia University) for bachelor and master students by ESI Center Eastern Europe with more than 100 students, providing an excellent example of integration and value-added synergy between industrial and academic knowledge and practice. This course is accepted as an introductory course for all SEMP academic profiles. An adaptation of PMBOK for software project managers is also locally implemented in FMI and NBU (New Bulgarian University), with respective links and practical examples of software projects and CMMI-compliant terminology and processes. Additional skills and knowledge include team and personal software process management (TSP/PSP), leading development teams – based on the original Watts Humphrey methodology, and delivered in both academic (semester) and executive (intensive, professional) versions of the courses. The Third, Business Oriented Focus Area, will provide students with grounding in the basic principles of how to manage organizations – be they in the private, public or not for profit sectors – and increasingly in a global setting. The second goal is to provide them with the opportunity to learn about the interplay of business processes and policy in the important verticals such as health care, logistics and supply chain systems, finance, and government. The third and final element is to provide a sound understanding of public policy issues that have become increasingly important in the design and development of software systems. Most of the courses are adaptations or improved versions of the courses already thought at Sofia University, American University in Bulgaria, or New Bulgarian University. That includes as well subjects like “Statistics for IT managers”, and the classics of strategic management by “Balanced ScoreCards” of Kaplan and Norton. A specific new developed course “Digitized Ecosystems” is dedelivered jointly with two “serial entrepreneurs” and piloted with 2 classes of 50 students already at Sofia University. The aim of the course is to provide business insight: a focused and practical real-world framework around the computer science academic lectures. It structured around the Dr. Edward Deming’s 14 key principles, providing an updated interpretation which incorporates evolving technological innovations with a humanistic economic approach. Even stand-alone, the course provides the tools for students to further excel in their career as senior technology specialists, managers, and entrepreneurs.